This little town, straddling I-495, northwest of Boston, is full of gems. Complete with a scenic setting, a storied history, and plenty to see and experience, Littleton is an idyllic New England town. 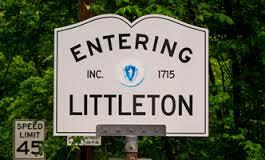 Settled in the early 17th century, Littleton was officially incorporated in 1714. Today, the town is home to nearly 10,000 people and is particularly popular with commuters who travel into Boston due to the commuter rail within the town. Additionally, the town's proximity to both Fort Devens and Hanscom Air Force Base, along with in-town major employer IBM, creates a hub for many different occupations. As far as recreation is concerned, Littleton is stocked with an array of options. For the artistically inclined, the town offers a community theater, choir, regular concerts and performances, and Indian Hill Music, a non-profit musical education center. For athletic types, the town's parks and recreation department offers lots of options from sports leagues to dance classes to self-defense. During the summer, Long Lake presents a wide variety of water-based activities, including sailing, recreational swimming, and kids' summer camps. Littleton is also home to Littleton Public Schools, which includes two elementary schools, one middle school, and Littleton High School. Littleton High School rates a 9 out of 10 on GreatSchools.com, and U.S. News and World Report ranked it as the No. 273 public school in the country, honoring the institution with its Gold Award. The area also provides the Francis W. Parker Essential School, a charter school, as well as Nashoba Valley Technical High School, which offers vocational and technical training. The average home in Littleton runs around $406,000, less than many of the surrounding towns, though the area offers properties both above and below that price point. While smaller, two-bedroom condos can be found in the $100,000-range, more expansive properties run just under $1 million.